You wanted it, and you got it! The Great Black North presents 2 hours of grim and evil music, featuring Canadian and international bands of both underground and world-class status! Check out the latest from the Canadian Black Metal Underground, featuring music from the likes of Wolven Ancestry, Hellacaust, Tormentor Allegoria, Protokult, and many more! 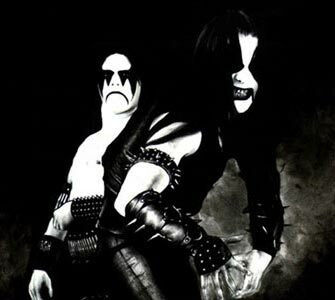 As well as world-renown and legendary black metal figures like Darkthrone, Impaled Nazarene, and Satyricon!! As usual, DJ Matt Hades gives his reviews and opinions on the black metal scene, as well as dishing out the latest Black Metal news and concert listings! So don your corpsepaint, clutch the biggest invisible oranges you can find, and crank up The Great Black North's Black Metal Special!! It's time for another episode of Canadian Metal madness here on the Great Black North, and this week's episode is a total madhouse! DJ Matt Hades is digging deep, deep into the underground of Canada's Metal scene, to bring you profiles of 3 of Ontario's youngest up-and-coming acts! Look for these, and music, from Toronto's Envenomation & Saprophyte , as well as Mississauga's Hallows Die! Also, new tracks from Borknagar and Unleashed, and many more!!! Plus the usual concert listings and Canadian Metal fun. Tune in and crank it up, eh!! It's Canadian metal time again, right here on the Great Black North! This week's episode brings all kinds of brand new metal from around the world, and a couple old classics I dusted off for your headbanging pleasure! Two of Canada's hottest new bands are featured this week, Montreal QC's Aeternam, and Victoria BC's Unleash The Archers! Along with brand new music from death metal titans Immolation, Obscura, and The Monolith Deathcult!!! It's open season on brutality on The Great Black North! !